On Tuesday, Apple updated its Pages, Numbers, and Keynote applications for iOS and macOS, with the biggest addition being a numeric keypad for Numbers users on the iPad. In the first software update after Apple made the suite free to all, improvements appear limited mostly to stability and performance improvements, according to Apple. 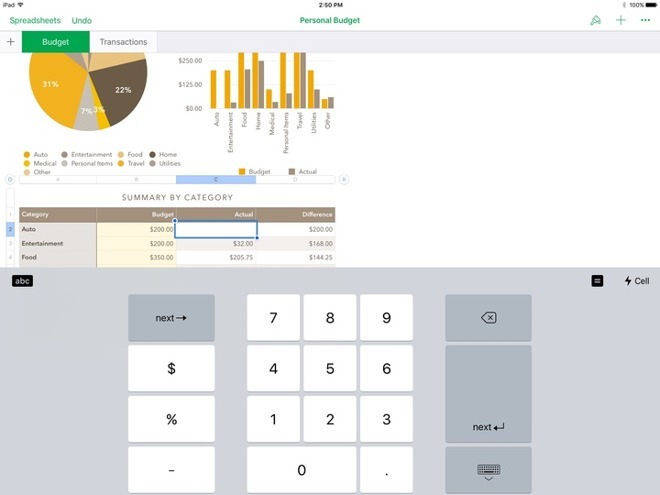 The major addition to the suite is a numeric keypad feature added to the in-app keyboard for the iPad in Numbers, which should reduce the need to switch keyboards while entering data in a spreadsheet. While the three productivity apps were released at the same time as iOS 10.3, none of them require it. For iOS, all three apps still require iOS 10.0 or later. Keynote occupies 695MB of device storage space, with Pages, and Numbers taking 482MB and 361MB respectively. The macOS versions of the iWork apps all require macOS 10.12 or greater. Numbers occupies 173MB, with Pages demanding 230MB, and Keynote taking 471MB.